If you have ever asked, “How do I use crystals during meditation?” this article is for you! Connect to yourself & the Universal Life Force through crystals! Bathing Crystals in the Full Moon. Crystals hold onto any energy they absorb, so it’s particularly important to make sure you’re regularly cleaning and cleansing them. Reiki Peace Garden Upgrade – Bring The Healing Power of Water To Your Garden! Here’s a 2016 twist on the Reiki Peace Rock Garden idea: add a free-form water feature to your outdoor space! Contrary to how it seems, building a garden fountain yourself is not that difficult! With enough research and planning, it’s a project you can accomplish in a weekend. Create and GIVE a healing water fountain as a gift this year … Spread your Aloha through Water! View in HD – Author, Channel, Geological Engineer & Gemologist James Tyberonn – A very informative, cutting edge discussion with Sandie Sedgebeer (Host of Conversations on the Cutting Edge) on the Human Aura, Protecting the Auric Field, use of Gemstone, Minerals & Crystals, Scripting Lifetimes, The Forgotten History of Gem Use for protection, health and vision. Dealing with Auric Maintenance, Causes of Auric Attachment & Psychic Attack, and Crystal Skulls as Living Libraries programmed by Past Advanced Civilizations. Very interesting from start of finish ! Bloodstone — Judy Hall suggests Bloodstone which is a well-known talisman and meditation crystal. Biotite lenses — Michael Gienger recommends Biotite lenses which is a stone that helps us seek balance and flexibility. Biotite lenses stimulate individual self-fulfillment. They allow flexibility and adaptation as long as the wearer does not become untrue to him/herself. Cinnabar Quartz — Robert Simmons advocates Cinnabar Quartz which brings growth and development. Welina mai, Na Kanaka. Hauʻoli aloha Pōʻakolu a me Hauʻoli lā Koa. Ma ia lā e hoʻomanaʻo ke Koa kahiko holo a me ānō kēlā paʻa iā māua pane kana mai hoʻopōʻino a ma mea ʻae lā kāua mea Mahalo na kou ʻoihana koa ia kā kāua āina. Ua lā pomaikaʻi au. Greetings, People. Happy aloha Wednesday and Happy Veterans Day. On this day lets remember the Veterans past and present that keep us safe from harm and let us say Thank you for your service to our country. Have a blessed day. Classic Vogel, Pranic, and ‘Apollo ARC Vogel’ Crystals, The A.R.C., Patent Pending GEM TECH treeoflifetech.com. This is an intro to the Vogel and ARC crystal, the basics, a little science and a little How To. This is also an intro to the Apollo Vogel Crystals. Gem, minerals, structured water, homeopathics, healing plants, platinum, gold and more placed and capped into a Classic Vogel Crystal. Presented by inventor of the Acoustic Resonance Crystal and Apollo Gem lights Apollo S. PhD. Trained in Vogel Sciences and techniques by Walber Pinto (Marcel’s ‘Protoge’), Joe Blankenship (friend and fellow scientist of Vogel and Wilhelm Reich), and others directly involved with Marcel like his cutter and friend Drew Tousley, Apollo and Tree of Life Tech has greatly advanced the understandings, sciences, and tools of many, especially Dr. Marcel Vogel and the Vogel Crystal. Amazing tools of healing, higher consciousness, and wellness. We would like the world to know that, as there is much conjecture over Vogel crystals, there is no trademark as claimed by Rumi Da of Lifestream crystals and Vogelcrystals.net. Rumi has lied about this and the way that he attained the trademark to begin with. Keeping this science and tools out of the public realm, and from other scientists and cutters. This technology is very real, not metaphysical as many describe. It is very physical an powerful when used correctly. Tree of Life tech has advanced the science like no other, and the Apollo Crystals, their filling, techniques, and magnetic drive interaction are powerful patent pending tools. Only from Tree of Life Tech. Natural Chalcanthite crystals are very rare in nature. Well-formed crystals are easily grown synthetically from copper sulfate solutions. This can be done by dissolving a readily available chemical salt called copper sulfate, and then letting the water evaporate. 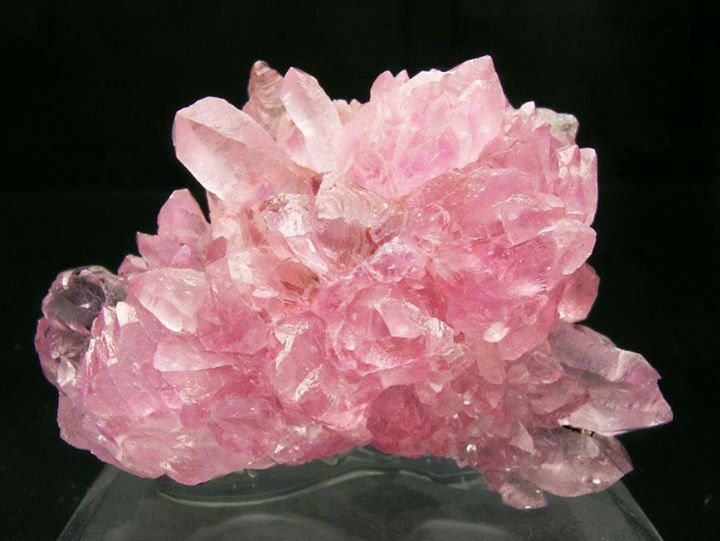 This leaves behind a crystallized mass of Chalcanthite which can crystallize beautifully if grown properly. If a Chalcanthite crystal looks to good to be natural, it probably is, as good natural crystals are very hard to come accross. Unscrupulous mineral dealers have been known to sell large, synthetic Chalcanthite specimens without indicating that they are not natural. Chalcanthite generally forms in arid regions and dry caves which are protected from moisture. It commonly forms stalactitic and botryoidal growths on the walls and ceilings of mine tunnels from the oxidation of copper sulfide minerals. Chalcanthite specimens must be kept away from water and moist conditions, since a chemical effect with water causes them to eventually crumble or dissolve. Some collectors specimens are coated with mineral oil and sprayed with laquer to seal the mineral and prevent it from absorbing water. Chalcanthite is a very fragile mineral, and care should be taken when handling any specimen. Chalcanthite is an important ore of copper in areas where it occurs in relative abundance, such as in Chile and Spain. It is also used as a root killer in sewer pipes by flushing Chalcanthite pellets down the toilet. Specimens are popular among collectors, and the synthetically grown crystals are often sold to unwary collectors. In Chuquicamata and El Teniente in Chile, large, fibrous masses occur in abundance and are mined as an ore of copper. A sizable deposit also exists in Minas de Riotinto, Andalusia, Spain. Also comes from the Sao Domingos Mine, Portugal; and Lubin, Legnics, Poland. Large botryoidal crusts were found Tsumeb, Namibia. In the U.S., the most prominent locality for specimens is the Planet Mine, La Paz Co., Arizona. Other Arizona occurrences include Bisbee, Cochise Co.; Ajo and Tiger, Pinal Co.; Globe, Gila Co.; Morenci, Greenlee Co; and the Patagonia District, Santa Cruz Co. Also occurs in Bingham Canyon, Salt Lake Co., Utah; and Ducktown, Polk Co., Tennessee. Few other minerals have the rich blue color and forms, making Chalcanthite hard to confuse with other minerals. Quartz in general are believed to act as an Amplifier of all Energies, Body, Mind and Spirit, and has as many formations as we do personalities. Crystals tend to draw “like minded” Energies to them and can aid in communication with the Higher Realms as they facilitate psychic and Healing Awareness and abilities. They can be used to Clear and Energize the Energy Centers (Chakras) of the body at all levels. They are a manifestation of Pure “Love and Light” and are a constant reminder of the blessings of Beauty, Love and Healing. The third eye chakra is our true inner self, our consciousness. It is the center of perception and command and directs our sight and everyday awareness of the world. It balances the important and the unimportant, sorting meaning from data and impressions and commands the energy flow within the body. When the third eye chakra is in balance we can clearly see and understand the things around us. We are able to communicate with our internal thoughts better and our perception is higher. However, when it is out of balance or blocked you will find yourself confused, difficulty seeing clearly, and a hard time differentiating what is important and what is not. You may feel as if you do not have command of your thoughts. Physical symptoms can include headaches, ear aches, and vision problems. Fear not though, even if your third eye chakra is blocked or out of balance, indigo colored crystals can make it better. Indigo is the color of an empty sky, of solitude, and reflection. It is a quiet color, one of mystery and wisdom, and judgment. 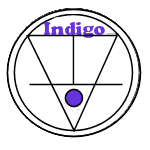 Indigo is a soft color ray that is made for introspection, and crystals of this color can help you immensely in your quest for wisdom. Indigo is the color of virtue and maturity. The dark blue/purple crystals of indigo are used to treat imbalances of the third eye chakra. Meditate with an indigo crystal over your third eye to help alleviate blockages and imbalances. Indigo Aura Quartz is very energizing on all levels, and can awaken all seven chakras, the energy centers of the body. The indigo hues in these crystal make them perfect for the third eye chakra. Indigo Aura Quartz is said to increase zest and enjoyment of life, and to dispel sadness. The rich hues of colors in this quartz are alive, dancing energy, ready to enliven your life, and add sparkle and magic to your day. Indigo Aura Quartz is also a Seeker Transformer Crystal. Seeker Transformers are talismans used when the desire is to find a way to transform a part of one’s life to a more desirable state. Indigo Aura Quartz brings you water energy. Water energy is the energy of stillness, quiet strength, and purification. It embodies potentialities unrealized. It is yielding, formless, yet powerful. Like a crisp, dark winter sky, Iolite, in shifting shades of indigo, violet, and blue carries the spirit of journey, of dreams and intuition, of exploration and illumination. Iolite examines the inner path of the deep self. It assists in letting go of the belief that one needs to control inner experiences, and dissolves fear of the unknown or suppressed parts of the psyche. It increases the capacity to move forward, and allows for the understanding that the examination of one’s wounds is the most direct path to healing. Iolite carries a violet-blue energy that activates and clears the Third Eye, opening communication and awareness from higher vibratory realms. When in the midst of adversity, Iolite helps to provide solutions to seemingly insurmountable problems. It promotes a calm, positive state of mind, instills hope, and assists in decisions on how to proceed. Crystal Vaults | The realization that color has influence over the human mind is as old as recorded history. What is difficult is to separate out the fact from the fiction. Colors have many meanings to people mostly based on their culture and religion. But the natural crystals and minerals have no culture and no religion. They are a part of the Earth. Their color influence rays stay the same. We see “red” when angry, and red inspires us to action. We are “blue” when sad. Yellow warms us. Green slows us down both mentally and physically. Based on extensive research in both the history and tradition of talismans and the more modern human psychological studies of the fundamental effects of color on human bodies and minds, we now know the real, natural effects of gemstone, crystal and mineral color influence rays. This wisdom is captured in the Great Talismanic Color Wheel of Influence. This Great Wheel of Life shows the entire year and the entire color spectrum as they naturally flow – bringing you the knowledge of your place and time. On the Great Wheel the colors flow from the dark indigos and blues of the winter sky through the promise of spring in the melting turquoise waters of the brooks and lakes as they are freed of ice. The colors change to the greens of spring, then to the bright yellows of the hot summer sun. The colors then start to darken, first to the oranges and reds of the autumn leaves then further as the Earth moves into winter, more into the amethysts, violets, and indigos of the now barren landscapes devoid of most plants, but still vibrant with the natural earth tones of the minerals and rocks. The natural color wheel shows the progression of life and color on the planet earth. In contrast to astrologicial signs and other birthstone lists, the color wheel shows us the color of our birth time on earth. The second ring of the wheel indicates the time associated with the colors. The wheel actually is read in counterclockwise order. Start from the winter solstice at the top and follow the color wheel and the year around to the left. The second inner ring shows the days of the year as the year and the color changes progress through the greens of spring, the yellows of summer, and the reds of autumn. 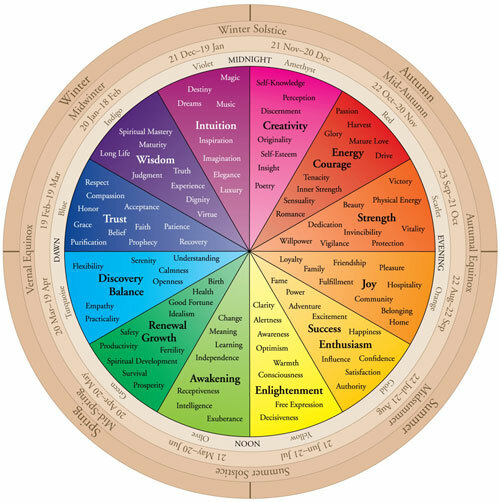 Not only is the Talismanic Color Wheel of Influence a depiction of the natural order of life through the year, it is also a depiction of the natural order of human life. The year starts as the days become longer at the Winter Equinox. Our lives start at birth. Our lives swing around the same wheel. We start as babies helpless and trusting to other for our care. Then, like other parts of nature, in our springtime of life we experience a period of rapid physical and intellectual growth as we find our way to adulthood and maturity. And, just like other life on Earth, a high summer period of young adulthood occurs when we have the enthusiasm, joy, and physical vigor of youth. We then have usually found our mates and paths and, as we mature into full adulthood, the time of passion arrives. We have found our loves, both physical and spiritual. As we mature and gather experience our lives turn inward with reflection and we see things for their real value. In the fall of our lives, our insights and understanding of our place in the cosmos grows. And we, in the winter of our lives realize periods of high creativity, and growing wisdom. The Talismanic Color Wheel of Influence shows us the dual nature of color and influence. It shows us that our cycles as people are aligned with the natural cycles of nature. Upon refection, how could this not be so? We are products of this earth. Green ~ Fuchsite, Red ~ Ruby, Blue ~ Kyanite and White to Off-White ~ Quartzite. This is a wonderful combination of elements that send out wonderful energies in all areas of life. It provides the connection of oneself with the soul level to help you on your spiritual journey while enhancing ones understanding of love at a higher level or vibration. If you have experienced an awakening within yourself, the energies will strengthen your heart & mind’s neural connections. This enables you to integrate the urgings that you may hear coming from your heart so that you can put them into action. 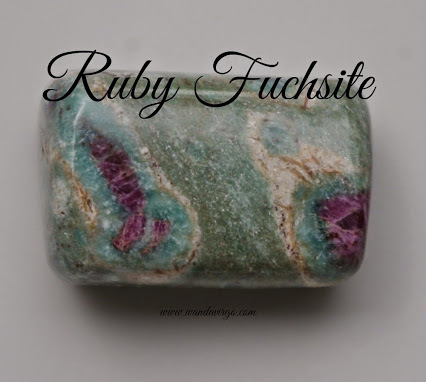 Both the Ruby and Fuchsite help to open & stimulate your psychic awareness. Placing Ruby Fuchsite on the Third-Eye can awaken latent psychic abilities by opening up the Heart Chakra to receive information. Since all three Chakra centers are stimulated by the properties of this lovely stone, you will find yourself in a state of harmonious balance. Enjoy this peaceful state, for it is the perfect breeding ground for a truly magical manifestation of your inner desires. Because your heart center is so affected by the Ruby in the stone, don’t be surprised at your new found capacity, to change your personal circumstances, to include more of the world around you. Your heart space is expanding to the eternal love of the Divine when working with Fuchsite, so expect change! Concerning matters associated with the heart space, such as, grief or anger, despair, loneliness & defeat, unhappiness or abandonment, to name a few. Fuchsite works well with healing the heart center to bring in the acceptance, peace & love which one needs to begin the healing process. Fuchsite with Ruby increases your energy field, strengthening your Etheric body, while cleansing the astral body of any negative attachments. On the emotional body, you will find this stone to be a powerful healer, bringing you to a place where positivism rules instead of negativity. 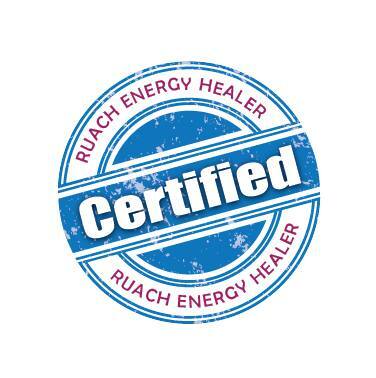 This allows the physical body to receive incoming, healing energy patterns. This highly spiritual stone will assist your growth in spiritual matters on your journey here. You may experience a sense of “knowing” that you never had before, allowing you to see the full essence of your true self. Enjoy the freedom this heart stone brings into your life with it’s life force energies. Truly magical indeed! This opal from South Australia is beautiful… but why does it look like this? It’s actually a photonic crystal! Opal is made of small spheres of silicon dioxide, the same stuff as quartz. These spheres are between 150 to 300 nanometers in diameter, and they’re arranged in a regular pattern. When light waves pass through an opal, funny stuff happens when the distance between these spheres is half the wavelength of the light. Imagine water waves trying to fight their way through a regular pattern of round logs standing in the water and you’ll get the picture. The waves start to bounce back and interfere with themselves. So, light of certain wavelengths winds up bouncing back off the opal instead of going through! 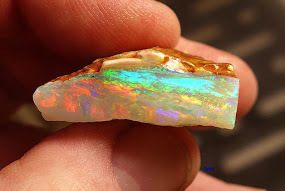 Since the opal is not perfectly the same everywhere, different parts reflect different colors of light. When a repeating pattern strongly affects the behavior of light, it’s called a photonic crystal. Nowadays people are making artificial photonic crystals. Way back in 1887, the English physicist Lord Rayleigh experimented with stacking layers of different materials to make light of certain wavelengths interfere with itself and bounce back. When this happens, we now call it a photonic band gap. But Rayleigh only got this effect to occur in a single direction – at right angles to the layers. Now people can make 3d arrays of tiny spheres that act as photonic crystals. We might be able to use them to make color-changing paints and inks. But the first commercial products involving photonic crystals are photonic-crystal fibers – a bit like ordinary optical fibers, but different. Photonic crystals are one example of a metamaterial – a material whose optical or electronic properties depend not just on their composition, but from carefully designed tiny structures. In the Middle Ages, some thought an opal could make you invisible if you wrapped it in a fresh bay leaf and held it in your hand. Now people are designing metamaterials that can act like a ‘cloak of invisibility’. But more about that later. Puzzle: I said opal is made of tiny spheres of silicon dioxide (called silica), but what’s in the spaces between these spheres? I don’t know – I only have a clue. Wikipedia says opal is a hydrated form of amorphous silica, usually containing between 6% and 10% water. Maybe the spaces between the spheres is a mix of silica and water? Aqua Aura is quartz crystal that has been treated with pure gold solution and when electrical current is applied in a special machine, fuses the gold molecules to the surface of the quartz; taking 12 hours to heat the quartz to 1600F while setting a vacuum equal to 2 earth atmospheres, then letting chemically purified gold vapors into the chamber when the temperature and vacuum are correct. This bonds the gold to the lattice of the crystal, forming a permanent bond to the surface of the quartz and giving it an electric blue color. The process was awarded the United States Patent No. 6997014 on Feb 14, 2006. The process was invented by Steven F. Starcke, Ronald H. Kearnes and Keven E. Bennet. While the patent might have been given in 2006, this material has been produced by this method for dozens of years prior. It is the exact same process that is used to coat steel balls to be used as bearings. Additional elements can be used to treat quartz, such as indium, titanium and copper. The coloring of this treatment is only on the surface, so all faceted and polished material you find has been treated after it has been made originally. Often, quartz of lesser quality, with fractures and weak spots, will break apart during the coating process. A little known fact is that the Aqua aura treatment can be used to reveal twinning in quartz crystals that would otherwise go undetected. Aqua Aura can enhance communications of all kinds. It can also assist in conscious awareness of one’s own motivations and patterns. Aqua Aura is said to attract success and prosperity, even possibly wealth, and it is also used for protection from psychic attacks. This wonderful quartz can assist one in plumbing one’s emotional depths and heights while simultaneously retaining inner peace. It can also be an aid to those who wish to become conscious channels for spiritual wisdom, clearing and opening the pathways of inter dimensional communication. 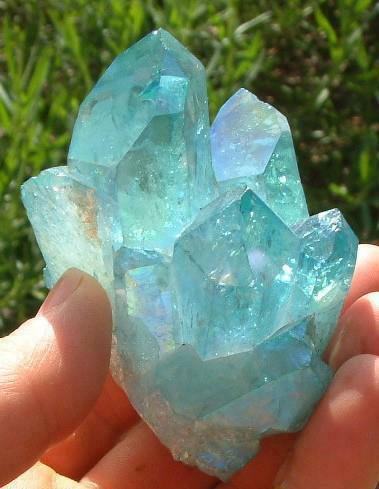 Aqua Aura Quartz has a very high and intense vibration. It has been used to activate the energy of other minerals and gemstones for healing work, and can be a potent stone when used in body layouts for activation of the Chakras. It can be success fully applied to smooth and heal the Auric field, and to release negativity from one’s emotional, physical, intellectual and spiritual bodies. Wearing Aqua Aura Quartz is said to help one to shine with one’s inner beauty, to attract wealth and success, to bring forth esoteric wisdom, to relieve depression as well as anxiety, and to assist in creating an aura of peace and well being in oneself and one’s surroundings. It is a stone of spiritual elevation, which can serve to help raise the vibration of humanity. Stone of Leo, Gemini and Capricorn this stone contains positive energy that removes mental blocks and promotes a sense of justice. Although Crystal Quartz has an enlightening effect on all the chakras, Aqua Aura is highly stimulating to the 5th, or Throat Chakra, enhancing one’s ability to communicate inner truth, at it also has a soothing and relaxing effect on the emotional body. It can be used to soothe anger, cool feverishness, and release stress, as it is strongly connected to the element of water, and it is therefore a stones for enhancing one’s access to the truth of the emotions and the portals of Spirit which are accessed through the emotions.